Swedish Professors Kalbro and Lind wrote in the Nordic Journal of Surveying and Real Estate Research no. 1/2007 about the valuation of market value of landed property in bilateral monopoly. In such a situation there is neither most probable price nor standard deviation (see e.g. Tenkanen 1984). Yet, exact market based compensations have to be decided in land consolidation proceedings by compulsory purchase, to be executed by the Cadastral Authority not only in Sweden, but also in Finland. For this purpose, many equitable valuation methods have been used (see e.g. Tenkanen 1983, p.205-207). In the following, some of them are discussed using Swedish and Finnish examples. In the compulsory purchase of building plot fragments in urban development the market value estimates are normally based on the average value method, where a land fragment is given the unit value (value per square metre) of the whole plot as indicated in the land use plan sanctioned. The method ensues from the fact that building on the plot is not allowed until all pieces have been joint (consolidated). The benefit resulted from the cadastral land consolidation, assumed identical with the market value of the whole building plot, is then normally shared by the fragments according to land area (or building right derived from land area). In such proceedings, every fragment benefits from the increase in land value normally according to the same unit value (current price per square metre). In this respect, the assessing convention is same in Sweden and Finland . 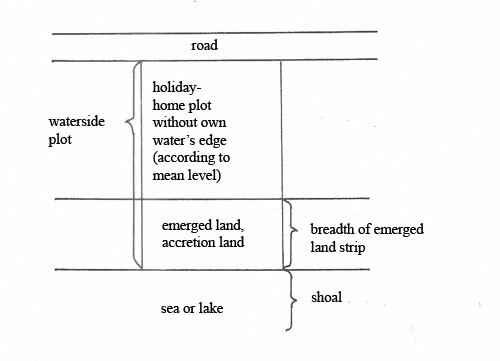 Compulsory purchase of a piece of emerged land (uplift land or land left by water due to lowering the level) usually covers a land strip which by nature does not form an independent building plot or maybe any other reasonable land-use unit in dispersed rural development. On certain conditions, it can be expropriated and consolidated with an adjacent parcel, e.g. a holiday-home plot. The proceedings in Sweden and Finland are similar, both based on the law titled Property Formation Act (fastighetsbildningslagen, kiinteistönmuodostuslaki). However, the cadastral proceedings are in Swedish classified as fastighetsreglering (a kind of land consolidation or readjustment), in Finland as vesijätön lunastus (compulsory purchase of emerged land). As the market value of a waterside building plot is normally considerably higher than that of a corresponding plot without immediate connection to water, cadastral land consolidation results in an increase in land value. Following the same main principle as in the consolidation of urban building plot fragments, the benefit from the proceedings should be shared between the land accretion and the existing building plot according to land area. In this case, however, the benefit remains much smaller than in the consolidation of land fragments, none of which is allowed to be developed independently. Therefore, the land accretion would probably not be given the unit market value of the waterside building plot. Systematic deviations may be justified in some special cases, for instance when the waterside accretion to the building plot is very small. But an estimate based on the unit market value of the waterside plot normally exaggerates the benefit ensued from land consolidation; the short-run calculations may even result in a negative outcome, if an accretion exceeds about 80% of the total waterside plot area (Tenkanen 1983, p.183). In 1989, the Swedish Supreme Court heavily reduced compensations for uplift land strips resulted in the situation where the sum of the market value of the redeeming building plot and the compensation exceeded the market value of the waterside building plot (see NJA 1989 s. 431 (nr 71)). In the precedent KKO 1996:103, the Finnish Supreme Court reduced the compensation by 33 % from the estimated unit market value of local waterside holiday-home plots. The court justified the decision by explaining that the price of the emerged land strip which did not alone make a legal building plot, was not [fully] comparable with the unit market value of the waterside holiday-home plot. In earlier resolutions, the ratio of accretion unit price to the current unit price of holiday-home plot had been even lower. But in the precedent KKO 2000:38, no reduction from the ratio of 100 % was made, though in the lack of better evidence on the appealing party. Since 1981, the compensations have varied between 40…100% of the unit market value of the waterside holiday-home plot, depending on the case. Presently, the land compensation politics is one of the topical issues of certain interest organisations. Appended in March 2011. There are cases where a rural land uplift strip may be consolidated with an adjacent parcel which alone is too small to make a legal building plot, but after consolidation a waterside holiday-home plot. In this case, the assessing situation is similar to land consolidation by compulsory purchase of building plot fragments in urban development. Analogically thinking, the compensation for the compulsory purchase of an uplift land piece should then be appraised according to the unit market value of the waterside holiday-home plot. Agreed prices of emerged land accretions to holiday-home plots represent a voluntary mode of sharing the consolidation benefit in bilateral monopoly. They have been fairly common in Finland, though not in all provinces. According to the studies conducted so far, the prices per square metre vary from almost zero to much over the unit market value of ordinary waterside holiday-home plots. The median price class among different owners has been 35–55% of the current unit price of the waterside holiday-home plot (Tenkanen 1983, Peltola & Hiironen 2007). Very poor quality of the land accretion may heavily reduce the relative unit price. The price agreements of the parties involved normally bind the legal executers of land consolidation. The prices which do not correspond to full compensation must not be accepted by the executers. Still some underestimation is possible, particularly due to a new interpretation of full compensation at the end of 1970´s (KKO 1978 II:123). However, the impact on median values remains marginal. Appended in March 2011. Total value added (increase in market value): market value of a waterside holiday-home plot minus the market value of the same area before consolidation. The market values of the holiday-home plots were estimated using empiric market price models. The agreed prises of accretion land pieces imply that the conveyor does not share the cost of the legal land consolidation proceedings. In the price agreements referred above, the land accretion value added was mostly less than 50% of the total increase ensued from land consolidation by compulsory purchase. The straight line in the graph shows the land accretion shares in the total increase in market value, provided they developed according to respective land area. Excluding the cases where the agreed prices might not cover the legal demand of full compensation (interpreted here according to KKO 1978 II:103), most points fit the line fairly well. However, there is one observation where the ratio of the share to the total value added is much higher than 1,0. Another observation represents a case where the increase in accretion value is only somewhat higher than the total increase. These findings can be explained by bilateral monopoly. The lowest shares in the values added can mostly be explained by organic soil. Appended in March 2011. Sharing the increase in market value according to land area seems to be the most logical simple method for assessing emerged land accretion to holiday-home plot. The method is analogical, but not identical with the established judicial convention in pricing building plot fragments in urban development. variable x: accretion area divided by waterside plot area. parameter s (0,65…0,75, typically 0,75): market value of the plot without own water´s edge divided by market value of the waterside plot, though assumed to be of the same size (Tenkanen 1983, p. 188, 265). may heavily reduce the unit price. The data are limited to holiday home plots 5,000 m² at most. In the lack of relevant median data between x = 0,05…0,20, the above y-estimastes are preferred. Emerged land strips corresponding x > 0,4 presume that effective building right increases in the proportion of land area. According to the preparatory work for the 1993 Amendment of the Property Formation Act in Sweden, both the conveying and the receiving party should be given a reasonable share in the increase in land value resulted from land consolidation by compulsory purchase. The share should be equivalent to that ensuing from normal voluntary transactions without any compulsory measures. Some academic bargaining simulations where the possibility of any compulsory measures was eliminated, have suggested a tendency of sharing the realised increase in land value by both parties equally (Kalbro & Lind 2007, p. 10–16). In Finland, the governmental motion for the present Property Formation Act traditionally includes the principle of judicial investigation as a general rule. According to late professor Wiiala, for instance, the legal executers of land consolidation and other proceedings of landed property were presumed to strive for justness, equity and objectivity, even if party involved failed to appeal to some relevant fact (see interpretations in the valuation of emerged land strips Wiiala 1976, p. 237, 238, 247 and 257).This principle can be derived from the constitutional rights. Equity consideration can never be completely pressed in one narrow formula. But with a couple of valuation methods or their combination the legal executors of the proceedings can clear a variety of cases. In the practical work, it is important to remember that the combination method was mainly fitted to price agreements from 1970's. Anyway, it would be most reasonable to make an agreement on the final amount of compensation. The agreements would probably be greatly influenced by former pricing conventions in the locality and the same may concern the compensations determined by the executers of the proceedings. Major sudden changes in the level of compensations may be felt inequitable in the market situation concerned. Therefore, the initial part of the combination method curve based on median price observations may need regional adjustment from time to time. On the basis of the present provisions, I would justify my own valuation on the one hand by full compensation, on the other hand by an equitable share in the increase in land value resulting from the land consolidation by compulsory purchase. Hiironen, Juhana, 2010: Voitonjakomenetelmä vesijätön arvioinnissa. Maanmittaus n:o 1/2010. Kalbro, Thomas & Lind, Hans, 2007: Compulsory Purchase – Reasonable and Fair Compensation. An Experimental Study. Nordic Journal of Surveying and Real Estate Research, no. 1/2007. Peltola, Risto & Hiironen, Juhana, 2007: Vesijätön arvo tontin lisäalueena. Maanmittaus n:o 2/2007. Tenkanen, Aulis, 1983: Ranta-alueiden, erityisesti lomatonttien lisäalueiden arviointi vesijättöjen lunastuksissa. Doctoral Thesis, the Helsinki University of Technology. References p. 280-286. Abstract. Tenkanen, Aulis, 1984: Compulsory Purchase in Bilateral Monopoly. Surveying Science in Finland. December 1984. Wiiala, Arvid, 1976: Kiinteistöarvioinnin käsikirja. The author is Doctor of Technology, Docent (emeritus) of Land Management, HUT, Finland. The article is an abridged version of the Finnish paper presented at the National Land Survey in the internal conference of valuation experts held 13 February 2008. The Finnish version was published in the journal Maankäyttö 1/2008.